Hey, you! You have been chosen to receive information about whatever it is Bioware are up to. So has everybody else, for that matter, but don't let that make you feel any less special. Also, "information" might be a bit strong. We've got a creepy live-action teaser, the phrase "you've been chosen" , and the promise of more to come at Gamescom, this August. "The time is near," states the description. "They are watching. Your power is rising. Cologne, Germany. You've Been Chosen." Internet sleuths have gone a step further, though, revealing references to the name Shadow Realm. The teaser is likely definitely not related to Bioware Edmonton's new title, revealed at E3. "We want to take on very contemporary stories," said Bioware's Casey Hudson, during a video shown at the time. "And yet we want to build a world that is as big and as imaginative as everything we've done before." Bioware announced this new video in an email sent to fans. 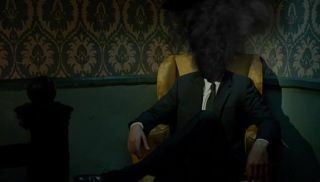 As seen on All Games Beta , the image in that email was named "ShadowRealms_Teaser_video.jpg". Earlier this year, EA filed a trademark for a game called Shadow Realms. Mini-update: Oh yeah, there's this too . On 25 February, Failbetter Games—of Sunless Sea and Fallen London—announced that they were working with Bioware. "I can't tell you anything at all about the project," Failbetter wrote at the time, "not for a little while yet – except to say that it's a Failbettery one, down to its bones." Given that the Shadow Realms trademark was also filed late-Feb, it's more likely that this —not the Edmonton project—is what the teaser refers to. Mini-update, part #2: Confirmation that it's not the mystery Edmonton project. That makes it extremely likely that it's the Failbetter collaboration. We'll hopefully find out for sure at Gamescom.